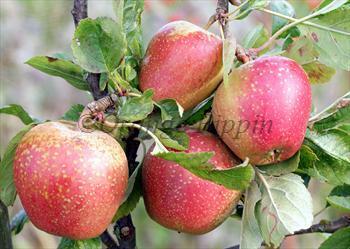 Adams' Pearmain is a well-known traditional English apple variety of the Victorian era which remains popular today. It is known for its rich nutty flavour, and was rated by the Victorian write Hogg as "A dessert apple of first-rate quality". Please fill in the details below and we will let you know when Adams' Pearmain apple trees are back in stock. Like Adams' Pearmain this is another late-season Cox-style with an excellent flavour. Little Pax has a similar pearmain shape and appearance, and also keeps well. Adams' Pearmain is in flowering group 3. Adams' Pearmain is self-sterile and needs to be pollinated by another tree of a different variety nearby. Since it flowers in the middle of the blossom season it can be pollinated by most other apple trees. Adams' Pearmain is generally easy to grow, and it starts to bear fruit at an early age in the life of the tree. Cropping is good, and it is a good choice for growers in wetter climates. The main problem to watch out for is a tendency to biennial bearing as the tree gets older - it may develop a pattern of alternate good and bad years. You can either just live with this, or attempt to even it out by over-thinning the fruitlets in the good year. This variety originates either from Norfolk or Herefordshire in the UK. It was first taken to the Horticultural Society of London in 1826 by a Mr Adams, under the name Norfolk Pippin, but subsequently became known as Adams' Pearmain (usually shortened to Adams Pearmain). The parentage is unknown but Hogg (writing in 1884) notes the similarity with the Hanging Pearmain of Herefordshire. There is some evidence that Adams' Pearmain is a triploid variety (3 sets of chromosomes instead of the usual 2) or perhaps a partial triploid. However it does not have many of the usual characteristics associated with triploid varieties, such as vigorous growth and large thick leaves.